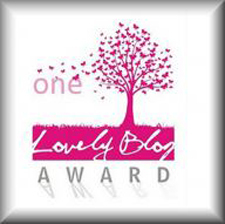 Once4always has been nominated for the One Lovely Blog Award. I would like to thank Otrazhenie for the nomination because this is my first nomination. This entry was posted in awards and tagged award. Bookmark the permalink. Thank you my dear, that is very kind of you -:)! Congrats for a well deserved ‘Lovely Blog Award’ Happy blogging!